This year we painted the house. The house is a half brick (the first floor) half stucco and timber (the second floor) Tudor style. The stucco and timber portion had started to look increasingly lifeless and ragged and in need of some TLC. Initially we thought that it might be a good idea to simply replace the stucco and timber with (easy to maintain) vinyl siding. So we contacted a bunch of different contractors and asked for quotes on that and were knocked flat by the sticker shock of it all. The quotes averaged around ten thousand dollars (ten thousand dollars!) to put siding up on half of a house. Ten thousand dollars was not in the budget. Vinyl siding was out. Plan B was to keep the stucco and timber (which we honestly like the look of) and simply (simply!) do all of the necessary repainting and repairing ourselves. This never would have gotten done if we tried to piecemeal it out over weekends only, so we took advantage of the long weekend and took the whole of the 4th of July week off. To paint. It also would never have gotten done if we relied on ladders and scaffolding. (The scaffolding would have been especially problematic given the bushes on two sides of the house, the trees out front, and the vegetable garden out back.) 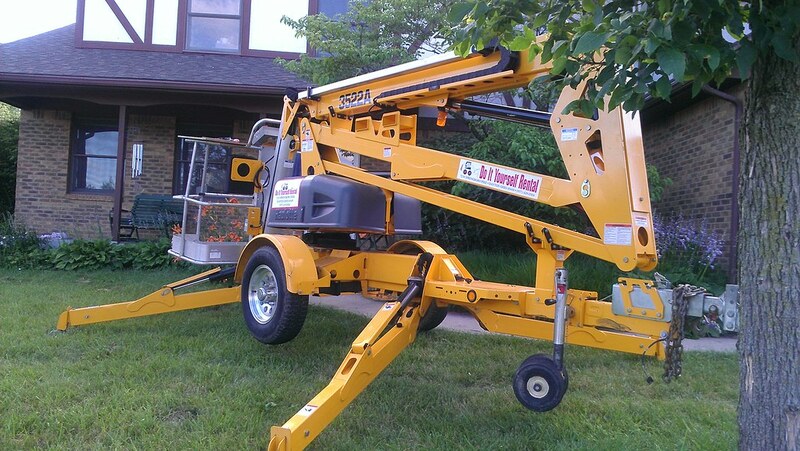 So we rented a hydraulic bucket lift. This was Zeno’s project… because the further we got into it, the longer stuff took. At the beginning, it seemed like everything went very quickly, primarily because we were painting large expanses of stucco, and it was easy to see the progress being made. Once we got to the more finicky portions, like the trim work, things slowed down. A lot. 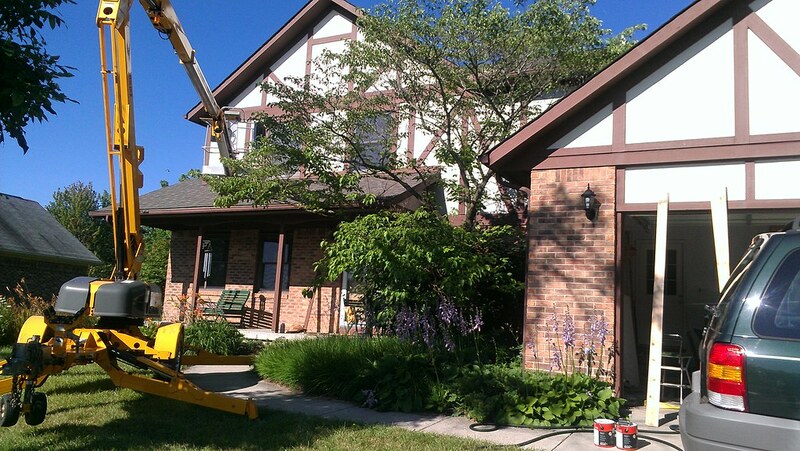 We re-painted all of the stucco, all of the wood trim, and repaired/replaced parts of the trim as needed. We painted the porch. We painted the garden shed. We are actually still not quite done, as there are still a few little bits of the trim work that need to be finished. And like all good projects, it has spawned additional projects. Because while the ladders and such are out, we might as well clean and fix the gutters. And we should really repaint the front and back doors to match the trim. And maybe do the deck as well. One of these days we will be able to sit back, say that we are 100% done with this project, toast ourselves… and move on to the next project. Because as long as you own a house, you never need a hobby.